Even someone like me, a former fat girl, can get tired of eating. It takes time and energy to prepare good food and sometimes you just want to focus on something else (see the hunger dragon mentioned in my previous post)! Vega : This is awesome. It has everything I need and it’s quick and easy. Although not ideal, I could really live off of this with no problems. Full nutrition. Vega makes powdered whole food meal replacements and energy bars that I eat pretty much every day. Their meal replacement uses hemp protein and pea protein as a base. When I’m taking this and/or The Ultimate Meal (see below) I find there’s no reason for a multi-vitamin. I won’t go into a full book-review here, but I liked what he had to say and it got me to try my first Vega product. Now, I’m a complete junkie. One of my favorites – Vega One. It’s full of nutrients, and actually somehow keeps me feeling satisfied for hours. It’s sweetened with Stevia, so when I’m PMS-ing I can have healthy “chocolate milk” without the sugar crash. My BF loves the chai flavor but hates the chocolate; I like the chai but LOVE the chocolate. I haven’t tried the other flavors yet. The one quality that puts Vega products above all the others I’ve tried – it’s quick and easy, and actually tastes great just mixed with cold water. No blender or crazy fruit/veggie adding required! 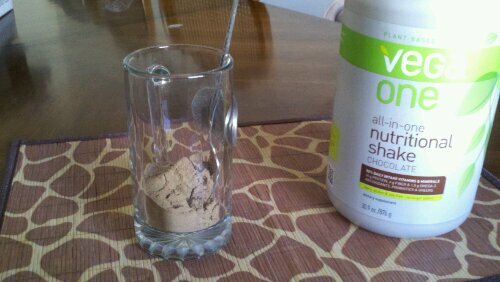 My strategy to mix up a shake with no mess (powder flying everywhere): Put the powder in the bottom of a pint glass, pour in just a couple inches of water, mix vigorously with a fork, then once the powder is dissolved slowly add the rest of the water while mixing less vigorously with said fork. If you’re thinking about nutritional supplements, definitely check out Vega, whether you’re vegan or not!